It's near the end of the year. I get it. You are tired. No, no. NOT just tired... but you're actually crawling to the finish line. You're almost there, my friend! So WHY am I talking about writing at this point in the year? Well, for many reasons. 3. You want to have fun at the end of the year and if you can incorporate some sort of learning ..then HECK YES! Believe it or not, I have something that will help you with all these concerns AND it's fun, fast, and EASY for you (more on that later)! I'm not sure if you've ever done journal writing in your classroom, but it seriously was our class favorite when I was still in the classroom! Kids would share their writings with their peers and I would pick a couple kids to read their journal aloud. Kids would laugh when responding to silly prompts and it was just plain FUN. Yep! I said it. Journal writing was fun! We didn't worry about punctuation. We didn't worry about correct grammar. My main goal was just to allow their creativity and thoughts to flow out. I wanted them to be able to express themselves without the worry of "getting it all right". There will be time and other assignments for corrections and lessons, but for now....for this... I just wanted them to freely express themselves. WOW. Can I just share with you the pure freedom? The pure joy that I saw take place? This time transformed into a time where my students could feel like they were not being "judged" or "corrected" for their lack of skills BUT praised for their wonderful creativity. It was a game changer. That's when their joy of writing came in. My students loved journal time because it was a time for them to freely express themselves. They didn't have to worry if they spelled this or that word correctly, or if this needed to be capitalized or not. Those thoughts didn't hinder them from continuing to write their ideas on paper. If this sounds interesting and you have a plethora of high engaging journal prompts, then I would challenge you to try letting your students be a bit more free without your corrections. But if you were anything like me and need some FUN high interest prompts but don't have the time to go searching for them, this is where I can help! This resource has EVERYTHING you need for the month and it really only takes a few minutes each day. 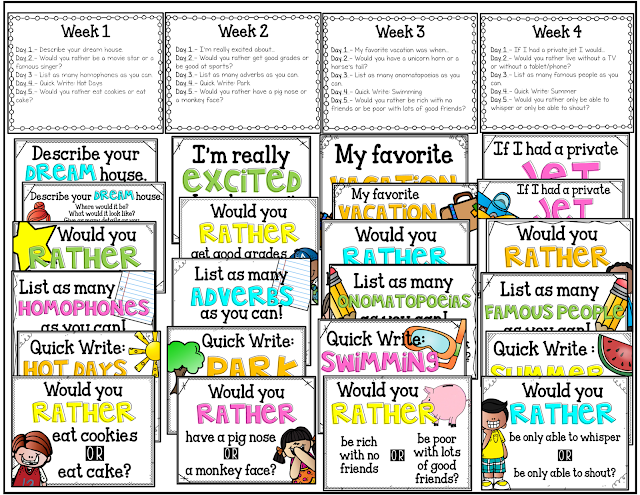 There are prompts for EVERY school day of the month and optional word banks for younger students or for those who need the extra help with ideas. Day 2 – Would you rather….? Day 5 – Would you rather…? This is the order of the slides, BUT you can use the prompts however you wish in any order. 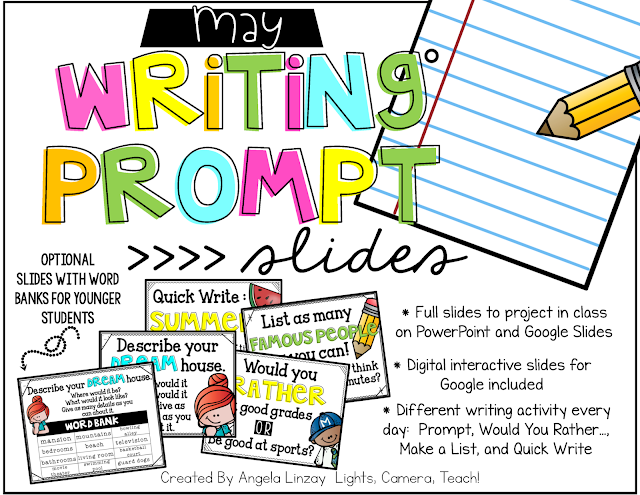 I love this resource because it's fast, easy, and comes in Google Slides, PowerPoint, and is also a DIGITAL resource.. which means that it can be PAPERLESS because students can type right onto the slides! 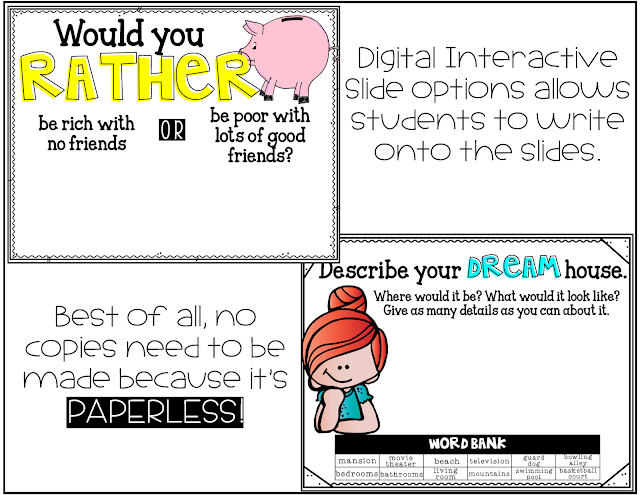 So whether you project it onto your classroom screen or push it out digitally to your students on their devices, it’s EASY for YOU because there is NO PRINTING involved! YAY! No more waiting at the copier just in time for it to break down. Or maybe that just always happened to me. I know that right about this time of the year, my students always needed a fun way to learn. We are just mentally D.O.N.E. and I'm usually winding down my school year. I love that they can still continue to write and learn AND have FUN in the process. That's a WIN-WIN for sure! So what about you? Do you worry about spelling and grammar at journal time? If so, do you think that you can let it go...even just for a little bit?